On Nokia N90 release it was obvious that the company is intending to apply the same design concept to several upcoming models. In fact, its strength is ability to carry more sizable camera modules without their functionality being cut, as when squeezing camera into smaller casings. But for all that the device gets bigger: although it incorporates mostly standard components like serial lenses and hardware modules, its price falls down as compared to more portable parts respectively. Basically the majority of manufacturers face one and the same issue of costs, since the more compact a gadget is, the more expensive it becomes. LG’s very own KG920 comes exactly from that boat – its camera module takes up more than the half of the device’s final price, while the prime cost of the KG920 is only 400 USD without regard for R&D cycle. That is how comes that the manufacturer insists that a cell phone should be not only capable, but popular as well. Thus sale rates may increase as the price comes down, however it’s essential to keep profit rate at certain level. In Nokia’s context this reasoning should be considered in light of marketing policy of the manufacturer, implying that the company tries out its all-new solutions with so called Techi audience (high-tech gadgets lovers), and only the next generation delivers them to the mass market. The enthusiasts don’t demand much of the novelties when it comes to dimensions or weight. These consumers count on extra functionality and innovative capabilities – for that they will overlook every thing thaw would be unacceptable on the mass market. 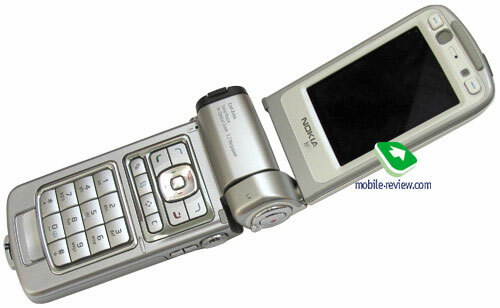 To make it clear, bring up Nokia N90 in your memory, a Nokia’s first handset to carry a 2 Mpix camera. After a while similar solutions, yet without auto-focus and plastic lens have become widespread over the Finnish manufacturer’s line-up. 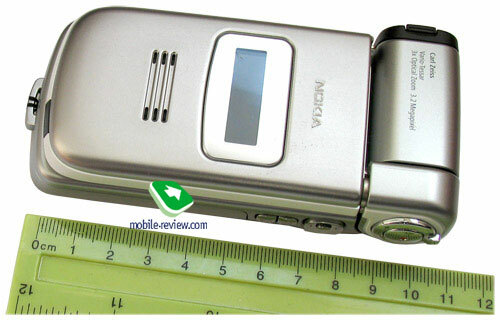 The inheritor of this product line is Nokia N73, offering a 3.2 Mpix camera, compact casing in candy-bar form-factor. The truth is, only these two are separated only by three years, but look at the distinctions. If the former handset was aimed at enthusiasts and could hardly meet the requirements of mass market, the latter one covers almost the entire audience and boasts of a portable shell. Almost the same situation happens to Nokia N93 – the device won’t fit the mass market, thus can’t be rated using this market’s criteria. Will all parts on board (strap, memory card and stubs), the N93 weights 188 grams. Throwing aside all non vital accessories we will get approximately 180 g. So this handset is obviously inferior to mass products, which offer 100 grams of weight, while all up-to-date smartphones are 130-140 g heavy. 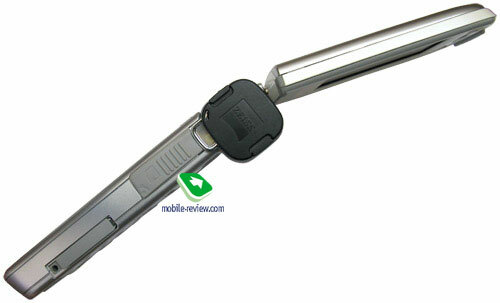 Due to bulky size of 118х55.5х28 mm it won’t slip in any pocket, especially in shirt’s one. Dimensions-wise the phone is in a number of biggest devices on the market, and this is it first major drawback. 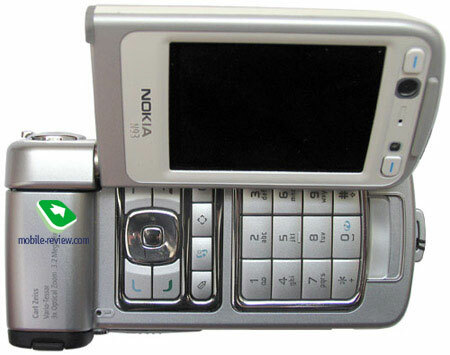 Nokia N93 features two color schemes – silvery and black. According to the surveys, bright gamma appeals more to women, while almost all men choose black trim. Though I can’t imagine why women should buy this phone, since its measurements will fit men audience more. 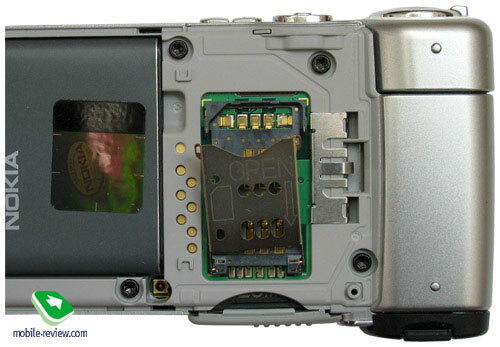 Unlike Nokia N90, where we saw twisting camera module, the N93 has it stationary, on top of that the design strongly associates with that of Nokia N92. These two phone are very close size-wise and powered by almost the same technical solutions. But if Nokia N92 has more of a test model for operators providing mobile television services and is available not in all retail stores, the N93 will be sold world-over without limitations on local operators. 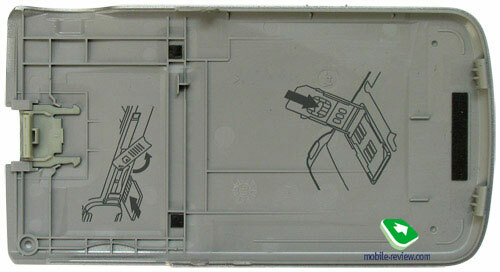 The top half of the folder may be twisted – the double joint is located on the right part, to cut a long story short, you can open the device like any other clamshell, or push the upper part sideways, thus the screen will be horizontally-orientated in the first place. The second degree of freedom allows twisting the main display towards you once you have unfolded it – this reminds of the portable video cameras, which use just the same mechanism. These actions actually lead to different modes, automatically recognized by the system. So when the screen is turned towards you and normal to the main block, camera capabilities will be called up without your help. 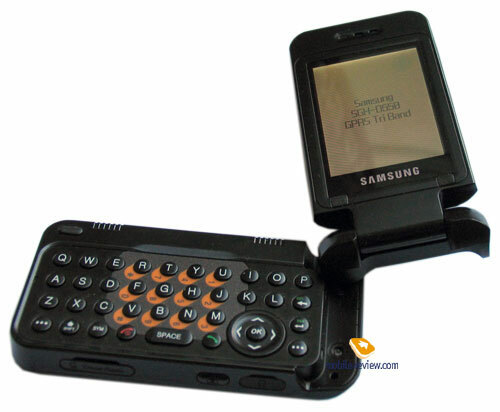 Some devices by Voxtel, Samsung D550 and Samsung D300 operate exactly in the same manner. Building quality is fine – all details are well-adjusted and have no gaps between each other. One could have expected the fastening with a single joint to be unreliable, nevertheless it isn’t so. Even if you shake the phone with all your strength, there is no way the halves will move towards each other. An external screen mounts the front panel and features a resolution of 128х36 pixels with 65 K colors (TFT). The display features not only a standard bar with basic indicators, but also an extra text one, which shows current time in standby mode. On incoming call the number is shown that string, of course this display won’t offer you the image of the caller. Turing the upper half so that the internal screen will come on top is not possible – it’s a peculiarity of similar designs. The display remains reading in sunlight, yet you will have to find the right angle first. Presence of an external screen is a major draw for this device, and the fact it is colored only adds to the experience, though from my point of view it could have been monochrome, since it features the very minimum of information. The display may be customized with the help of additional wallpapers set via the menu. 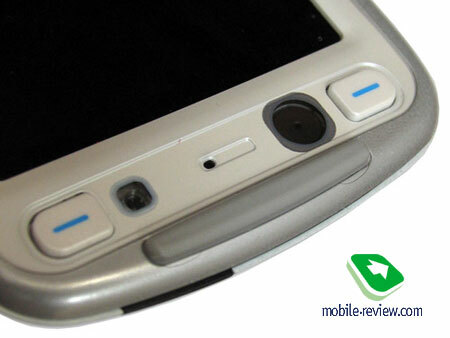 The speaker playing all the tunes finds its place under the screen – even though it is loud enough, the one of the N91 still overcomes it. The sides are the upper half are edged with a tiny line of bright plastic, which make bulky size of the construction less evident. 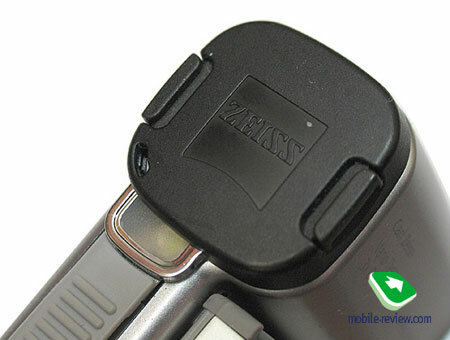 The bottom rim houses Infrared port and strap slot, the latter detail appears to be quite strange, since the N93 can be carried on your hand, like any digital camera out there, yet handing it on your neck may cause certain inconvenience. 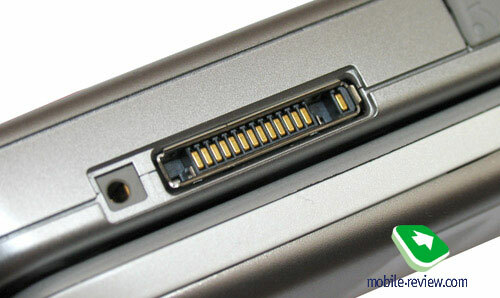 Standard interface connector Pop-Port and slot for charger are found on the left side play. The Pop-Port is covered with a plastic stub, which is easily removed at any moment. miniSD expansion slot, protected with a plastic stub fastened to the casing, is positioned more towards the upper end. 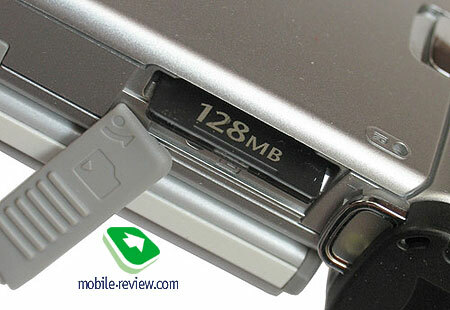 A miniSD card may be up to 2 Gb big; even though the handset fully supports hot swap, I wouldn’t recommend changing cards on the go for people, who store on them applications, as well as various media files. The power key mounts the top rim, the same button stands for switching profiles while in standby mode. The right rise features camera shortcut key. 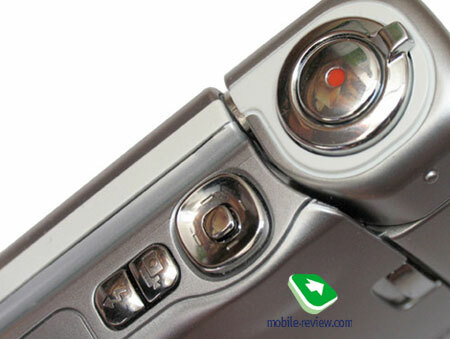 The trigger button, marked with a red point, is originates from usual digital cameras, as well as a ring rounding the key, which performs zooming. 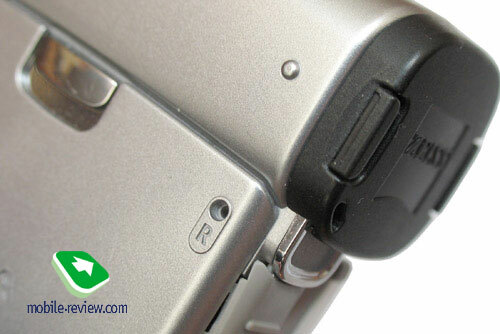 The navigation key with OK button placed inside is located a bit lower – it’s used for changing camera modes and browsing through the menus, not in camera application. Frequently this very button allows managing the handset single handedly; however the dimensions override this handy possibility. 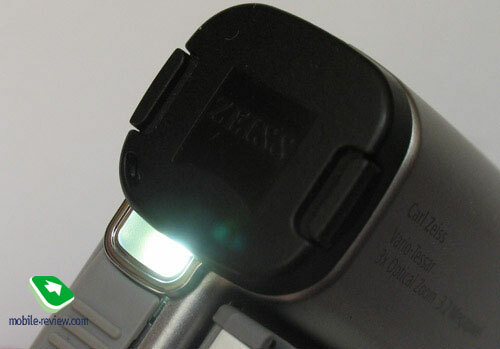 Dedicated flash button becomes flashlight trigger while in standby mode – to tell the truth this might be the only application of the flash, as it doesn’t make much difference when taking pictures, because it’s rather weak. 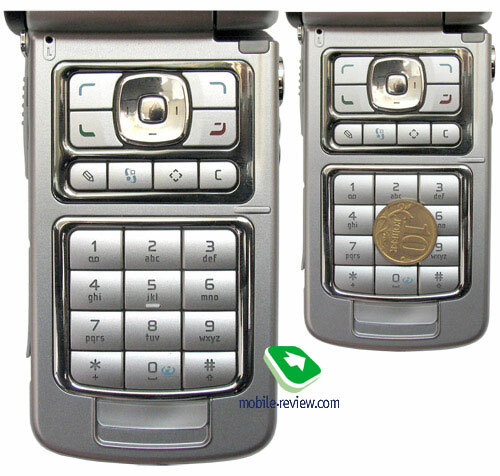 The side “OK” button locks and releases keypad lock, and once again, you can hardly make use of it. The Shutter key turns the external display into monochrome one, where you are shown current date and time. 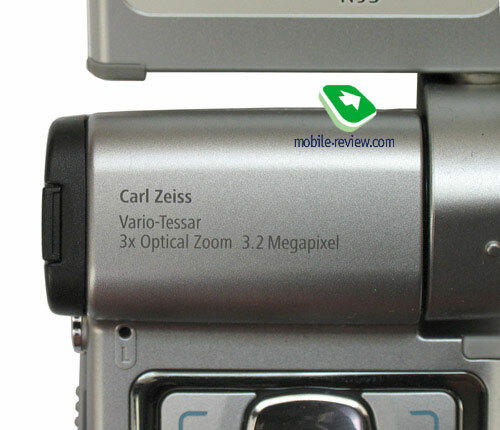 The reason why the camera is integrated into the upper rim is not its actual measurements, but rather presence of optical zoom. Size of the matrix has remained pretty small and equals 4.5х5.5 mm, therefore images quality is not too far ahead of the competitors, however implementation of glass lens and considerable focus length allow acquiring good results. A small hood covering the lens which can be fastened to the casing with a strap is also an appealing detail. All in all, the manufacturer has succeeded in creating an illusion of a tiny amateur camera. Unfolding the device reveals the internal screen with a CIF-camera located right above, which steps in when making video calls, yet you are at liberty to take pictures with it as well, though there is no practical use in it. A curios fact – this camera is armed with a flash model, thus you can hold video calls even in darkness. The area over the display contains two buttons, execution various functions in some applications, however their primary predestination becomes obvious when in camera mode, namely they call up advanced options menus. The truth is, it is hard to operate these buttons some times due to considerable weight of the handset, although when holding the device sideways, they are more than just handy. The internal display adopts the standard technology for its generation; particularly this is QVGA resolution, 240x320 pixels. While the N80 flaunts a diagonal of 2.2 inches, the N93 easily beats that value with its 2.4 inches – the manufacturer has meaningly declined the idea of embedding the N90 screen (352x416 pixels) in this unit, as those displays are still pretty pricey. Obviously, the company has held aside these cutting edge solutions for next generations of Nseries devices; in fact we will have a chance to try that display out with the N83 slider (the same one is found on Nokia N80). 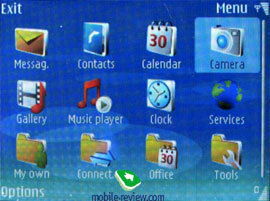 The screen is capable of reflecting up to 262 K colors, what is quite enough for any user. Similarly to all up-to-date TFT screen, this display is equipped with a mirror layer, which prevents information from fading in the sun. 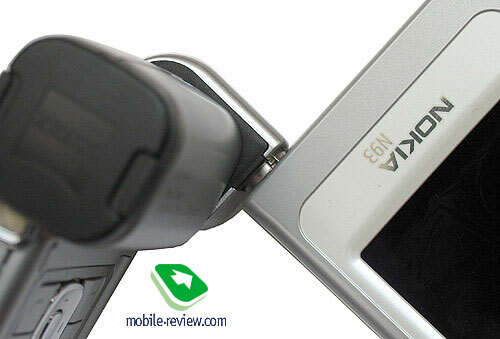 The same technology is applied on Nokia N80, Sony Ericsson K790/K800. Thanks to this film, the viewing angle achieved on this model is close to 160 degrees. Although this parameter is not vital for mobile phones, unless you are going to watch video with friends, yet the screen is still rather small for this entertainment. The color on screen seem to be bright and vivid, information is easily readable, I’m not even talking about shots taken with the built-in camera, which look really great and only stress display’s excellent capacity. 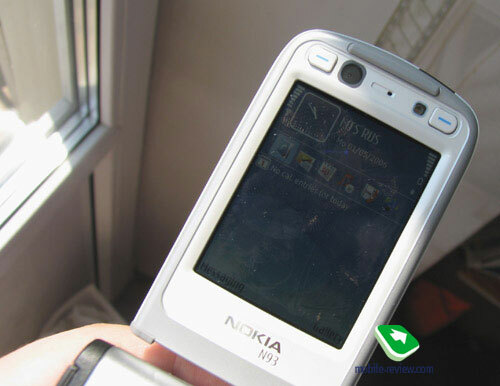 Not countingЕсли Nokia N90, this model’s screen claims leading positions in its class. 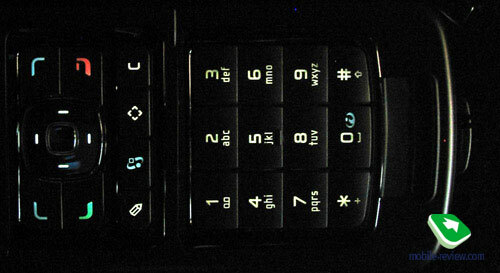 The keypad offers backlighting indicator, which may be switched off if necessary. The keys themselves are pretty sizeable and soft; basically the experience is great, though I can hardly imagine how someone could expect something different in view of such big casing. 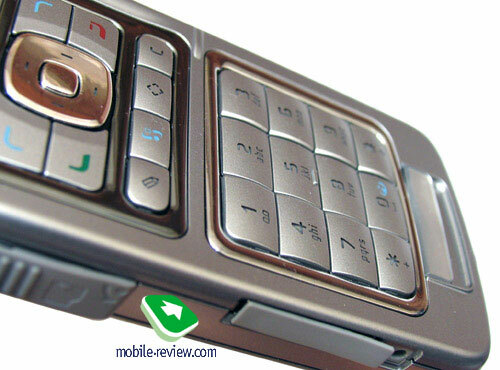 The soft keys are positioned in row right beneath the navigation keys set – there is no joystick on this phone. 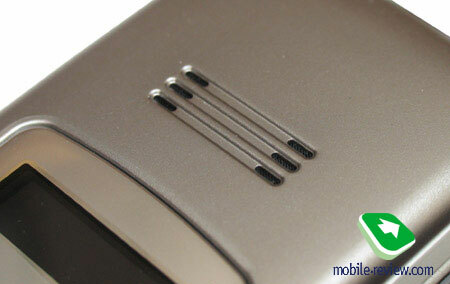 The keypad’s surface is lit in white, what makes it visible not in all environments, yet don’t give much of a trouble. Having removed the back panels, which, does not have gap and hardly can obtain it in course of usage by the way, you will discover SIM-card’s slot and also a battery. The phone supports hot swap, yet it’s not recommended to switch cards while the smartphone is on. 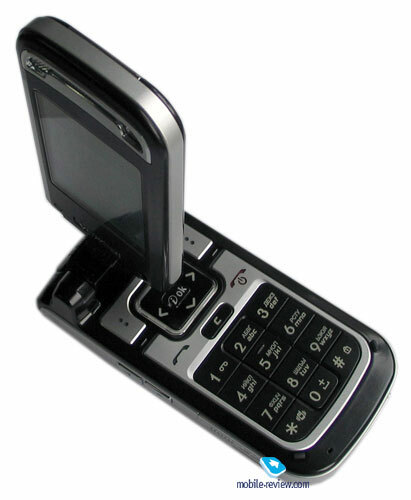 The handset makes use of a Li-Ion battery, namely the 1100 mAh capable BP-6M. The manufacturer claims the life time of 240 hours in stand-by mode and up to 5 hours of talk time (GSM-bands) or nearly 3 hours in UMTS-networks. Our unit lasted for about 1 day, yet over that time we intensively used the camera and kept Bluetooth constantly on. Therefore if you are not going to be heavy on such services, you are more likely to squeeze about 2 days, just like on all up-to-date Nokia’s smartphones, and I don’t think there will be significant declinations from this value with this handset. Full recharging takes a bit more than 2 hours. There’s no use in telling you about standard features of S60 3rd edition over and over again, they were reviewed in this article. I highly recommend you reading that article, especially if you are not familiar with OS and its realization of standard features, meanwhile in this topic we shall speak about handset’s specialties, how its ergonomics has changed. 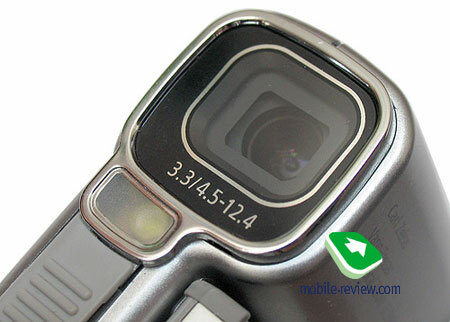 Photo part of N93 deserves separate article, and it will be published shortly. Meanwhile now we shall speak about main stuff. Platform on which this model is based is different from latest N-Series phones, including N91. Processor is operating at 314mhz, this has been subjectively proven by tests, results were very high. Amount of RAM is 32 megabytes, meanwhile 50mb are dedicated for user’s needs. Amount of memory is not so big, especially if you take high-res camera into consideration, so the first thing you have to buy in case you are planning to take a lot of photos – is s a 2gb memory card. 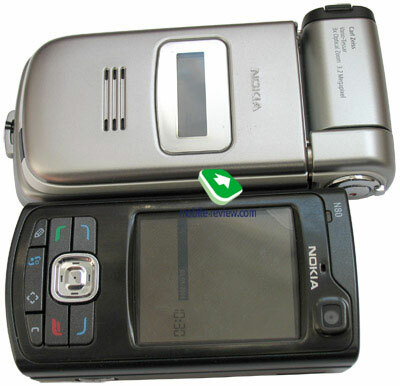 Continuous evolution of interfaces lead to fact that nowadays Nokia smartphones have audio and video ins, which makes it possible to connect them to common household devices. Cable has standard “tulip” connectors on one side, and Fast-Port connector on the other. Phone supports following standards: PAL, NTSC. In settings menu you can select display’s geometry – 16:9 or 4:3. This way signal will be recognized instantly, and the picture will appear on both the handset and the TV. And it’s not only viewing photos or video clips that you can do, you can also play games, browse menu, do whatever you like. But main reason for this cable is still viewing multimedia, games do not look so good on TV, and menu is quite hard to browse as well. 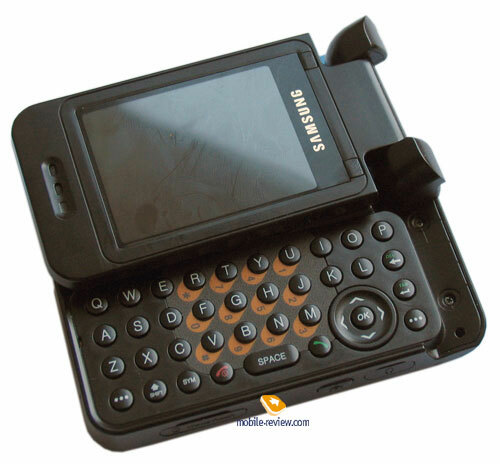 There were only few phones that had such capabilities of interaction with household devices, most famous example is of course – Samsung D600. Here you can also see presentations and office documents, you just have to start required application. Besides cable, there is another, more convenient way of displaying multimedia content on screen of your TV or PC – it can be transferred via WiFi. You must have required software on PC or a special multimedia center that supports WiFi. Technically, working with such technologies is no harder than sending file via Bluetooth. In future as conception of “intelligent house” goes on expanding, more and more devices that support connection with mobile phones, and interaction with them will appear, and it’s not only about TVs, it’s much more than that. Handset supports Dual Transfer Mode (DTM), this allows transferring voice and data in GSM/EDGE networks at same time, this is A class device (multi slot class 11). A nice ability that makes this smartphone closer to UMTS terminals that have this functionality by default, without being one. One thing should be noted though, in case if operator is not supporting DTM, there is no way you can use it. At same time, there’s still EDGE B Class, multi slot class 32. Picture Bridge – direct printer connection that supports this standard. Well, there’s almost no need in mentioning Bluetooth module’s presence, it became sort of standard for smartphones. As for version, it’s v1.2, and following profiles are supported: Basic Printing Profile, Generic Access Profile, Serial Port Profile, Dial-up Networking Profile, Headset Profile, Handsfree Profile, Generic Object Exchange Profile, Object Push Profile, File Transfer Profile, Basic Imaging Profile, SIM Access profile и Human Interface Device Profile. Several connections can be made simultaneously. As for Bluetooth’s drawback: there’s no A2DP profile support (stereo headset). This handset has Wi-Fi (IEEE 802.11 g) support. All security standards are supported: WEP , WPA , WPA 2, settings are maximally advanced, although it’s hard to compare it with Zero Configuration in Windows Mobile in terms of convenience of connecting. Device supports Universal PnP standard (UPnP), which is successor of wired standard PnP. With its help and usage of Wi-Fi you can send slides to TV, music to stereo system, and photos to printer. At some point UPnP is similar to upgrade over infrastructure (to Wi-Fi as example), especially if you compare it to Bluetooth-like services, this looks like software upgrade. So far support of this standard is interesting from theoretic point of view, but it’s still something like tomorrow when we see this standard being widely implemented, although the list of companies that support this standard today is quite impressive. You can get acquainted with documentation on UPnP here. A software named Home Media Server is shipped on Software DVD, it allows connecting through home Wi-Fi network to desktop PC. Music player did not get any updates at a glance, but in fact this handset now has full support of OMA DRM 2.0 and Janus DRM from Microsoft. These technologies were supposed to be present in Nokia N91 at start, but manufacturer was not able to do it in time, some other models are missing it too. 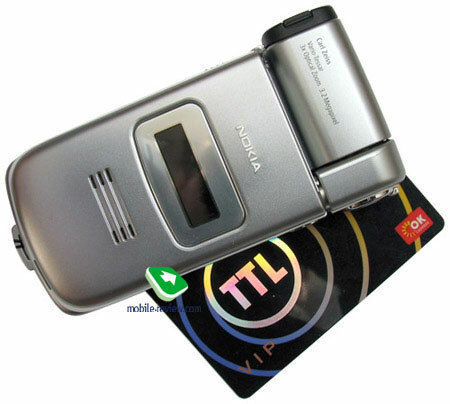 But by the time Nokia N93 will be released, copyright protection will be fully ready. Support of Janus DRM means full synchronization with Windows Media Player 11, when connected via USB, handset will turn off network block, and offers synchronization with this software. You can transfer playlists, songs from PC to handset. Music Library offers viewing all music files stored in phone’s memory or memory card, they can also be sorted by genre, artist, album or composer. Library can be updated automatically when you add new music files. Unfortunate news for those who plan storing large music collections – there is no search function at all. You can only view songs manually via corresponding sections. 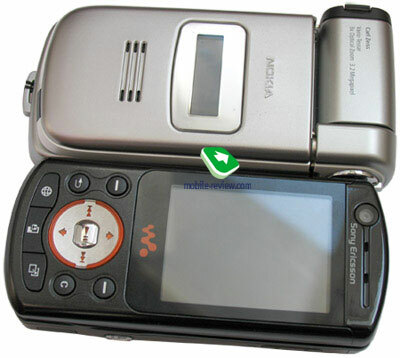 On the whole player is similar to different models produced by Nokia, except for Nokia N91. 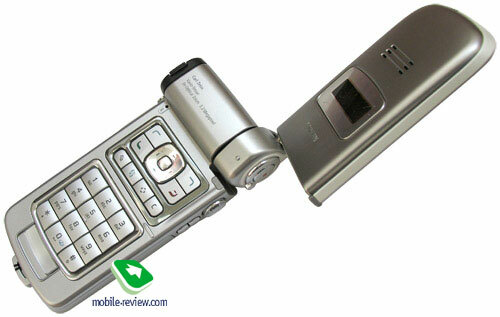 As for sound quality, it’s ordinary, and is different from Nokia N91. Handset supports following music formats: eAAC+, AAC+, M4A, MPEG-4 ACC LC, LTP, MP3, AMR-NB, AMR-WB, 64 polyphonic MIDI, WMA. Most interesting ones are: mp3 (all bit rates are supported, including variable), AAC in all modes (for iTunes users), and actively promoted WMA from Microsoft. For any playlist you can enable shuffle, as well as repeat one or all songs. There are several preinstalled equalizers, you can adjust them manually. Well, it’s not like you will notice much difference when switching between them, in order to actually do that, try setting up last settings. Player can be minimized, in this mode you will see song title and its playback time in stand by screen. Built-in FM radio supports Visual Radio upgrade, when text and image will be downloaded from radio’s site. This function looks rather exotic, and it failed to get many followers. As for ordinary radio, it supports not only 87.5 to 108mhz diapason, but also from 76 to 90 mhz. 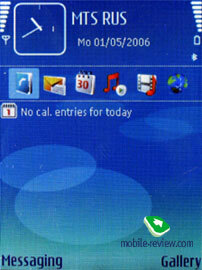 Nokia Web Browser – standard browser, different from those we’ve seen in previous models, similar to one in Nokia N80. This is open-source development, which will be top-attention spot in upcoming models. One of browser’s possible disadvantages is its concept on the whole, it displays pages the way they were designed, without any optimization of content to fit device’s capabilities. Well, the picture will get stretched to fit the screen, but still you have to scroll not only vertically, but horizontally too. One of main concerns is that browser downloads all what we can see on the page. We have made a little test, by opening one and same pages with built-in browser and Opera Mini. Opera’s software uses intermediate server for optimizing content, scaling pictures. Difference was amazing in 3G network: homepage of 220kb opened in built-in browser within 6 seconds, meanwhile Opera Mini managed to do same operation within 3. Following research showed up pretty much similar statistics. Meanwhile in EDGE/GPRS networks it’s clear that Opera Mini is the leader, this solution is also a must-have for those who prefer saving traffic. Of course there are some consumers that demand content being displayed “as is”, without any modifications. Built-in browser will be interesting for them, but for most users this browser might become quite an expensive toy in case if it’s used often, unless their operator supports unlimited data transfer. On the other hand, disadvantages that we mentioned above will go away after 3-4 days since you’ve started working with that. First of all, you come to realize that scrolling should not be done unless the page has opened completely, otherwise you may end up with browser crash. Browser also has mini-map technology, when you hold cursor in any direction, you will see a small thumbnail of page and red square which shows your current location. On the whole scrolling page with help of mini map is convenient, although it’s not that fast on big pages. Any page can be scaled from 50% to 125% (one step – 25%). There can be up to 5 pages opened at once in separate windows, in case they are “heavy”, you may run out of RAM, you will be notified about that. Another issue is history section of browser, in which you can see thumbnails of pages you’ve visited. Though it becomes unclear why pages load from start once you decide to visit them. Bookmarks are common, they have auto-complete function for visited pages, so called adaptive ones. One of interesting parts of this browser is possibility to search within one page, including local languages. In European versions there will be all encoding s for Russian language, not only Unicode. Browser operating speed is fine, there aren’t big problems with this parameter, most importantly you should be aware of several applications being active at same time. It seems we started with a sad note, but let’s finish description of browser with something more optimistic. At the moment this browser is very interesting, and in case you take fact that it’s standard browser into consideration, than it turns out not only interesting, but also nearly flawless. You should spend couple of hours on learning how this thing works, its peculiarities, get used to it. In case you are not aware of pages being fully loaded, this solution will suit you for constant usage. Performance. Considering fact that this handset is built on same hardware platform as Nokia N91, as well as some other smartphones from Nokia, only changes that could have occurred would be related to different display resolution. In 3D packet we saw lower performance, meanwhile in Jbenchmark1, Jbenchmark2 we’ve seen better results when compared to Nokia N91. Explanation is quite simple – Java was optimized. This handset has no problems with signal reception, voice of interlocutor is clear, just like your own. Volume of 64-tone polyphonic ring tone is average, but in case you choose mp3 file as ring tone, polyphony does not matter that much. Vibrating alert is slightly lower than average, sometimes you may miss a call due to that. 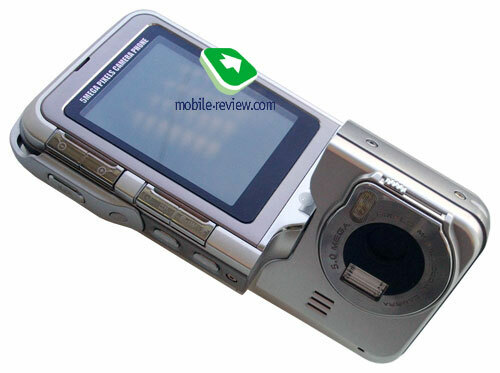 As for video recording, its resolution – this model is best on the market once it will be released, same goes for photo quality, but here difference in photos when compared to Sony Ericsson K790/K800 is insignificant. 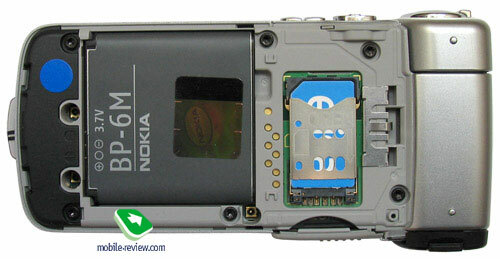 You will be able to find out more in our stand-alone material, that will be dedicated to photo-part of Nokia N93. 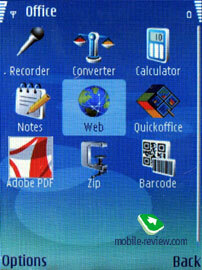 One of unusual moments is presence of preinstalled software that can work with office documents, including QuickOffice, this is one of the best applications for Symbian. There’s also PDF-file reader. All these applications are available for existing smartphones too, you just have to pay for registration key. The disappointing things are: limitation in Dictaphone – 1 minute, it looks anachronistic today. Another disadvantage is size of the device, it’s too big. But this is due to camera module, and other parts of device too. 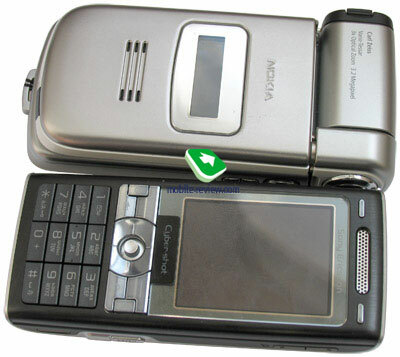 For example, similar product Nokia N80 is smaller. Manufacturer claims that this device supports full-screen video playback in horizontal mode, but no matter how hard we tried, we always had control icons and video was not stretching to full screen. Except for these insignificant drawbacks, this device has no special problems, platform on which everything is built is pretty well-spread and reliable. This device will go for sale in July, its price will be around 550-600 Euro, which is not that much considering the functionality. It does not have direct competitors, this is another innovative device for technological pioneers, including those who seek for video recording in decent quality. This device will be in demand for those who really need all those features. 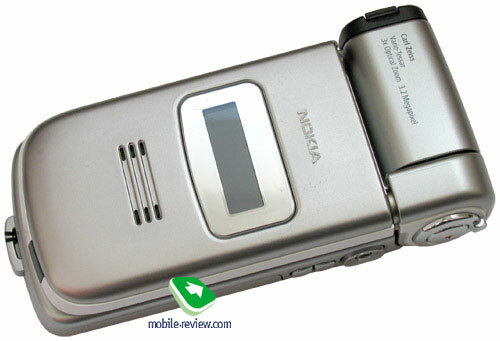 At same time there’s Nokia N80 which is targeted at more common auditory, in future we shall see Nokia N83, which is a hybrid of Nokia N91 and Nokia N80, and it also has 5mpx camera. 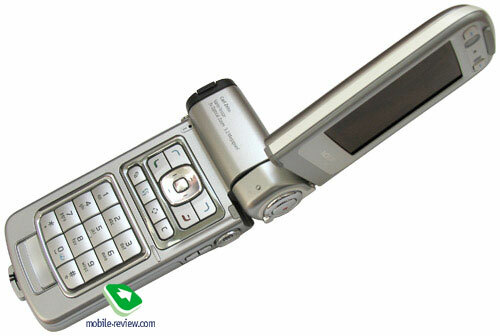 At same time Nokia N93 should be considered as model on which company is trying out several new technologies. This is common for manufacturers. Comparing photos made with N93, Nokia N80 and Sony Ericsson K790 is the most interesting part, and you will be able to read about it in next chapter, stay tuned!